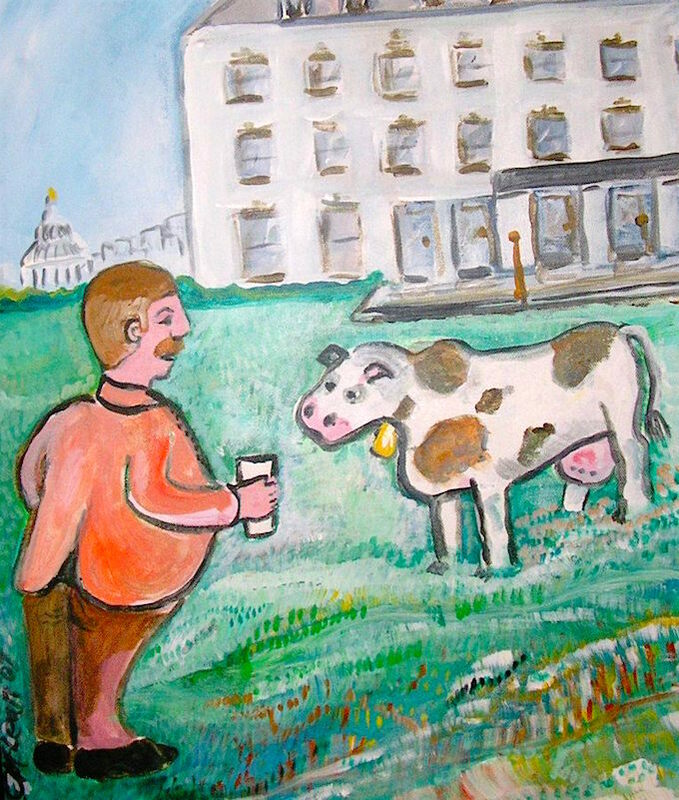 Cows at the White House? You bet. Until the late 19th century, cows were commonplace at the White House, since Washington, D.C. had no dairy or milk delivery companies. 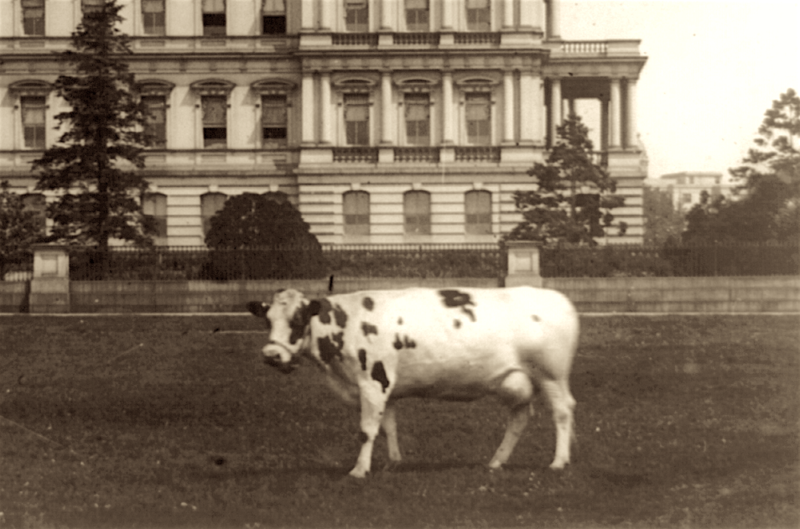 Our 27th president, William Howard Taft, was one of the last presidents to keep a cow on the White House grounds. He brought his cow Mooly Wooly with him to Washington. When Mooly Wooly died, another bovine soon entered the picture: Pauline Wayne, often called the “Queen of the Capital Cows,” a pretty 4-year-old, black-and-white, 1,500-pound Holstein-Friesian cow of registered stock. 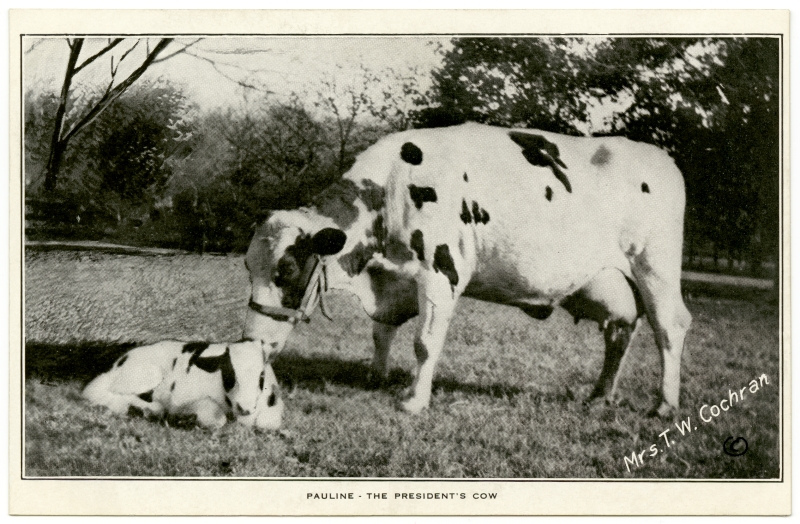 Pauline, whose job was to provide milk and butter for the First Family, was a gift from Senator Isaac Stephenson of Wisconsin, selected from the many purebred cows on his farm. Pauline arrived at the White House in a big crate and in good condition considering her journey from Kenosha, Wisconsin by train. A group of White House employees met the cow at Union Station and accompanied her to the stables and to the grassy area near the State, War and Navy Building (now known as the Eisenhower Executive Office Building). In addition, the Times said Pauline would soon be giving birth. The calf, named Big Bill because of his size, was born a few days later and went off to live in Maryland. 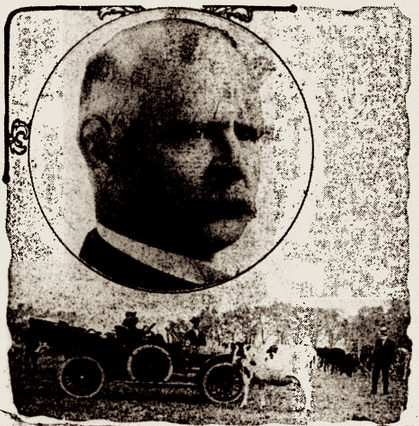 In an odd series of events, the cow somehow got lost on the way to the dairy show — and “narrowly escaped death” in a slaughterhouse, according to several newspaper accounts from October 1911. Pauline Wayne was being shipped in a private train car that was attached to a whole train of cattle cars bound for the Chicago stock yards. Somehow the presidential cow went missing for two days. The White House and the dairy show frantically “telegraph[ed] everywhere in search of her whereabouts,” reported The New York Times. So what was behind the cow’s disappearance? According to The Milwaukee Sentinel, a train switch crew had mistakenly switched Pauline’s car. A handful of attendants who found Pauline Wayne convinced the stock yard that this was indeed the president’s cow — and she was saved “from the bludgeon of the slaughterer,” reported the Times. Whew, close call! About a year later, another interesting (and creepy) event happened in this cow’s life. She was robbed. Well, sort of. The Milwaukee Sentinel reported in September 1912 that an agriculture teacher from Ohio, who was visiting the nation’s capital, spotted Pauline grazing on the South Lawn. He told the newspaper that, seeing no security officers, he stealthily approached the cow. “Soon he obtained a supply of milk,” the article stated, that tasted every bit as good as the man had heard it was. 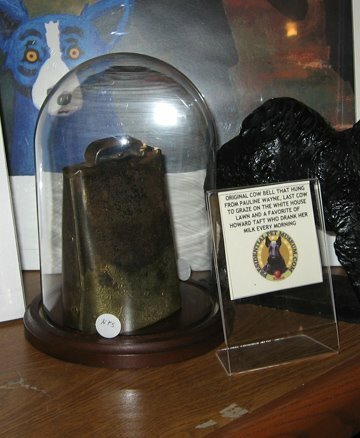 Painting by Presidential Pet Museum founder Claire McLean. “A search of its archives re­veals more than 20 stor­ies men­tion­ing Pau­line between 1910 and 1912,” says National Journal. This cow was no doubt the most famous White House cow ever, getting invited to cow shows everywhere (which President Taft declined). She even got an offer to appear in a traveling production of the play Way Down East — which President Taft also declined, with a chuckle. Being a celebrity had a price for Pauline, though. Her health had visibly declined in the two years she had been in Washington, so Taft decided to send her back to Stephenson’s farm as his presidential term came to a close. Once again, The New York Times was on the story and reported on Feb. 2, 1913 that Stephenson was glad to have Pauline back, quoting him as saying the president’s cow would “add dignity” to his herd.